Refractive error is the technical term used to describe the focusing inadequacy of the eye, requiring the use of glasses to refocus. Light enters the eye and is focused, in the most part (90% in fact), by the cornea, the clear window in front of the eye. 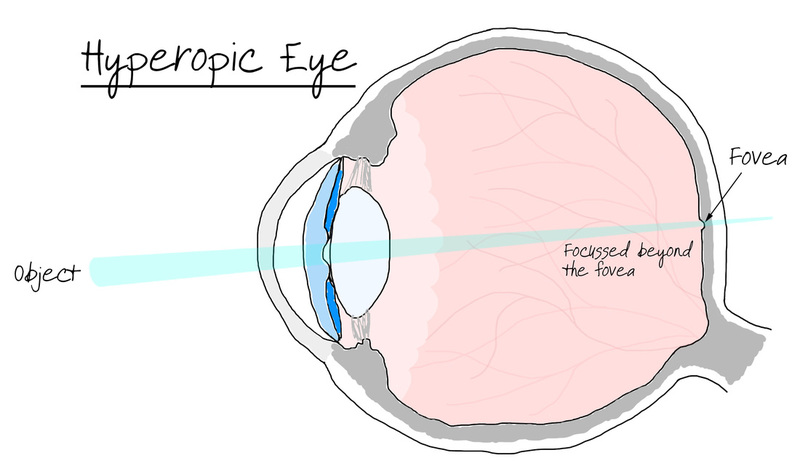 It then passes through the anterior chamber, the crystalline lens and the vitreous cavity, all of which contribute to the focus of light onto the fovea at the centre of he macula. If the lenses of the eye and the length of the eyeball itself are not perfectly paired then the light will not arrive at the fovea sufficiently focused and leaving you with a blurry view of the world. There are several different ways in which the eye can loose focus and we have attempted to explain a little about the different types of refractive error here. A refractive error which needs negative lenses is termed "shortsightedness" or myopia meaning that the eye is naturally focused close to itself and cannot focus in the distance at all. Myopic people have fantastic near vision without glasses but cannot focus in the distance at all. They often can be seen screwing their eyes up in an attempt to reduce the amount of light entering the eye which is then easier to focus. Due to this constant frowning patients often suffer with headaches as they over use the facial muscles. Hyperopia the technical term for "longsightedness" means the eyes focal point is beyond the horizon, these refractive errors require a positive lens for correction. 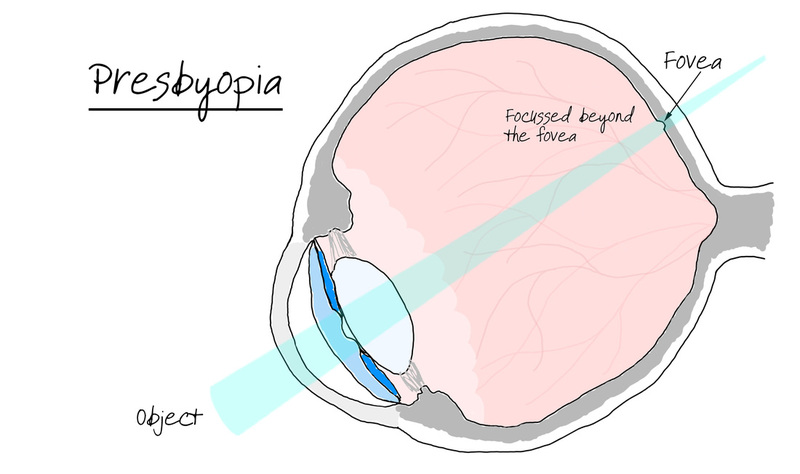 In hyperopia the eye itself has to exert an effort to refocus at all distances. It has to work especially hard when focusing close distances for tasks such as reading and computer use. The eye uses a small muscle called the cilliary muscle to exert a pulling force on the crystalline lens within the eye. This changes the lens shape and thus the focal point of the eye. Over-exertion of this muscle causes fatigue and muscle stress, you can experience this in many different ways but it usually manifests as eye ache or headaches. We term these symptoms asthenopia. There is currently a lot of research being conducted into why people develop long/shortsightedness and some of the theories have led to advice and products aimed at reducing the progression of refractive errors. To find out more take a look at the Myopia Progression page. 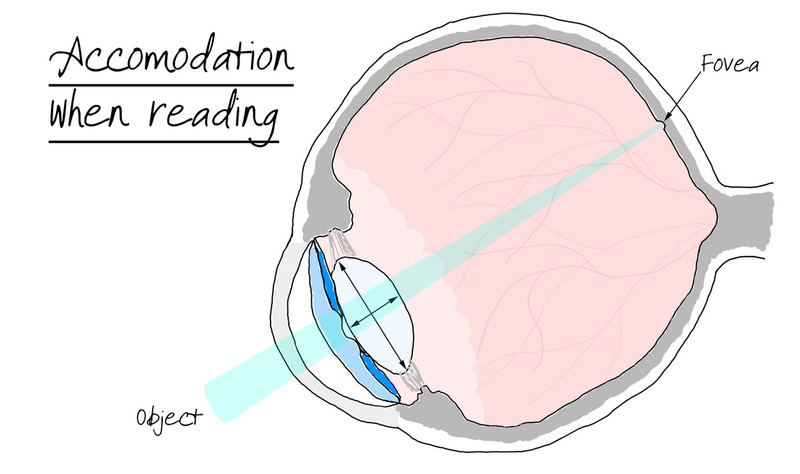 Diagram of a longsighted eye, the light is focused behind the retina. 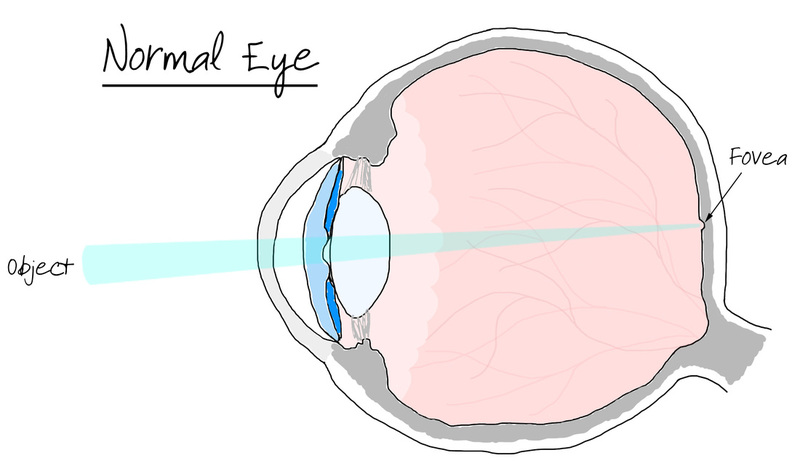 Diagram of a shortsighted eye, the light is focused before the retina. 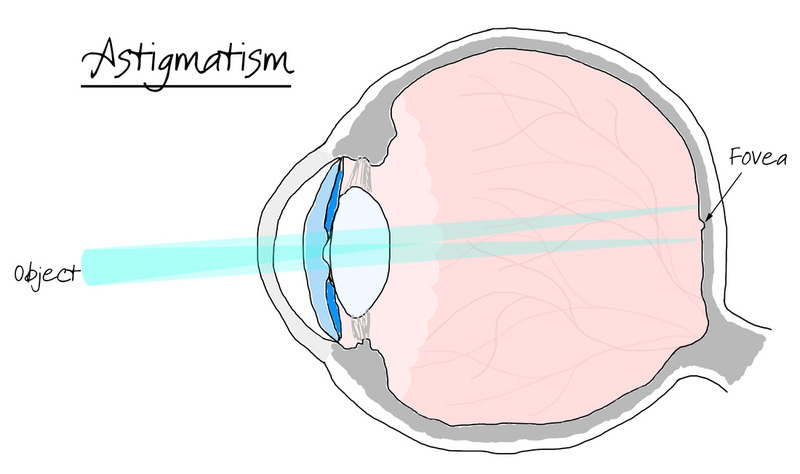 Astigmatism refers to a slight distortion in the cornea shape resulting a flatter curve at right angles to a steeper one. This creates a rugby ball like shape and results in two different prescriptions needed at right angles to each other. Uncorrected astigmatism will cause distortion of the image and this can be seen as a ghosting affect. A second image of the object being looked at can be sen just behind the object itself as if it were shadowed. Once corrected the glasses can give headaches for a period or strange sensations and feelings of walking up slopes. This is due to the eye being used to distortion. It can take a few days to realise the new view of the world. When we view things at different distances to ourselves the focus of the eye needs to adjusted slightly to have sharp vision. This is only practically necessary for anything closer than about 10-15 feet away from you. Anything beyond that is generally in sharp focus without the need for re-focusing (that is unless you are short/longsighted). Think of a pair of binoculars or a camera, exactly the same applies to the eye. To view things closer to you, you have to tweak the focus of the system. The eye does this by cahnging the shape of the crystalline lens using the cilliary muscle and the lens zonules. The lens is very pliable and changes shape and, therefore, focus, in order to make the images at a closer range sharp. The trouble is this refocusing mechanism starts to diminish as we get older. This is due to a number of factors but mainly it is due to the crystalline lens becoming stiffer and less able to warp and change the focus of the eye. Presbyopia, means "Old Eye" in ancient Greek and occurs when the eye runs out of this ability to change the focus of the eye. It typically occurs between the ages of 40 to 50 and means that the eye cannot focus close to and as such will need a top-up prescription for any close work such as reading. It also means that anyone with an underlying hyperopic prescription that in the past has been self-corrected with the eyes own ability to re-focus, will begin to need glasses for everything including distance. This is because the eye can no longer re-focus to compensate for the longsightedness. Those of us who are shortsighted can have a small advantage at this stage. This is because in a shortsighted persons world everything close to him/her is in clear focus, it's the distance that's the problem. Therefore, if a shortsighted person removes their distance spectacles they will be able to read quite comfortably. If they are very shortsighted they will still be able to read without correction and in fact things can be very slightly magnified also, however, the working distance can be quite short, meaning books and papers have to be held quite close to see them well enough.